Jacob has combined an eclectic background in waste water management, welding and electrical engineering to specialize in cooling systems required for particle research. His contribution to this field in the publications "Gel-based coolants" and "Solid-state pump design" have made him a minor celebrity at many Isochronous Cyclotrons. And he can brew his own beer which makes him very popular here at EniTech on Friday afternoons. He was asked and contracted on January 10, 2008 to pose for a test photo for the tachyon camera, taken by a wall of Enitech's building, then to return to the same location in approximately 1193 days at the right time, to see if the camera would show what he looked like in 3 years. The initial photo and the tachyon photo are shown to the right. A photo was seen in a hidden frame of a video blog posted by Enitech, which showed the murdered body of Jacob Gustar. Jacob was quickly confirmed to be with the Enitech team alive and well after recording that same video blog. Taken from 2nd floor looking down onto mid-level landing. 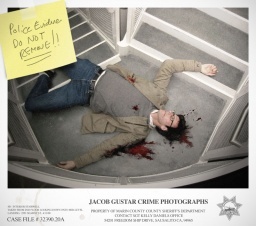 As per the date located on the crime scene police photo described above, this is about the date that Jacob will supposedly be murdered.